Auto Shipments from Anita Goodesign to the Store or your Home! Get $1400 in Free Gifts when you sign up for $1399.99 Option. 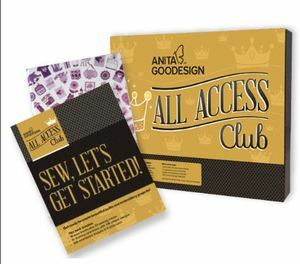 Anita Goodesign All Access Club Program 12 Month Subscription is more than just an embroidery Club. Not only will you receive at least six brand new collections every month; you'll be receiving experiences. Our quilting and embroidery designs provide endless hours of fun so you can have the time of your life while stitching out beautiful, custom made gifts for yourself and your loved ones. Our All Access Club members receive every retail collection we release, so you will have no problem building your library and finding everything you need for all of your projects! Join All Access and choose your free gifts! We will contact you after checkout to confirm which starting items you would like.